It was a quiet, peaceful night at our canal side-tie at Port la Robins. Everyone slept well, as the night had been a bit cooler. We had our coffee and breakfast on the boat and prepared to depart. 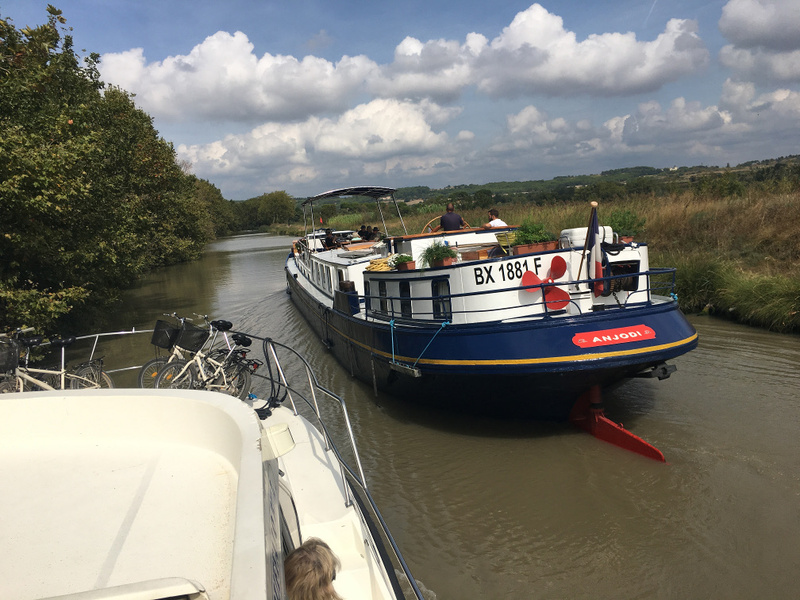 As we jumped onto the bank, we noticed that somehow our rear stake had pulled free from the bank and was laying loose on the bank – in other words we no longer had a two-point tether to shore. 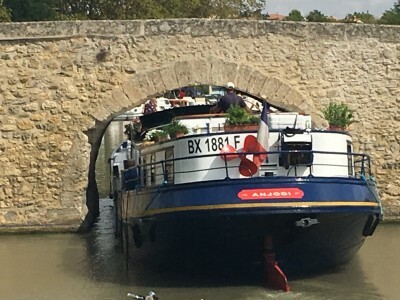 This had never happened to us before and it was a bit disconcerting, as the stern of the boat could theoretically have drifted cross-wise out into the canal. Luckily this had not happened and no harm came of it. More luckily, our metal stake was still on the bank, so we were not left with only one stake for future tie-ups. We resolved henceforth to verify that we had driven our future mooring stakes securely into the embankment. Today we were aiming to reach Capestang, which would be one of our longer journeys at 20 kilometers. 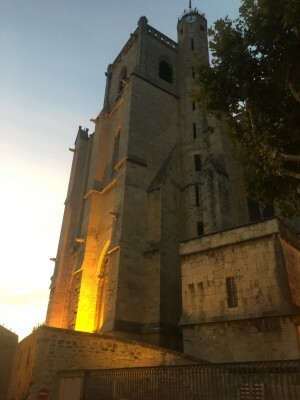 Our first stop, however, came soon at the village of Argeliers. We had been under the impression that today was market day, but we soon learned that this was not the case. While provisions were scarce, we did find an épicerie and a boulangerie, so those served our needs. We also located a memorial plaque in Algeliers commemorating the location of the historic local wine grower’s revolt in the early 1900’s. It seems that at that time, the region was being flooded with Algerian wine that was being artificially sweetened. A certain Marcelin Albert organized 400 local wine growers to reject this approach in favor of purely natural wine. As a result the process of sweetening wine, known as chaptalization was outlawed. As we continued towards Capestang, we came up behind a quite large commercial sightseeing barge that was moving noticeably slower than us. Roger was at the helm and in a nice long, straight section of the canal, he attempted to pass. As we approached the helm of the barge, however, we could not overtake the barge. It appeared to me that the barge was speeding up to prevent us from passing. Try as we might, we made no headway – and so we again fell back behind the slow moving barge. As we fell in to trail the barge, it’s captain yelled out at us to “enjoy the ride”. We had no choice but to throttle back and cruise even slower than our normal top-end speed of 8 kph (about 5 mph). 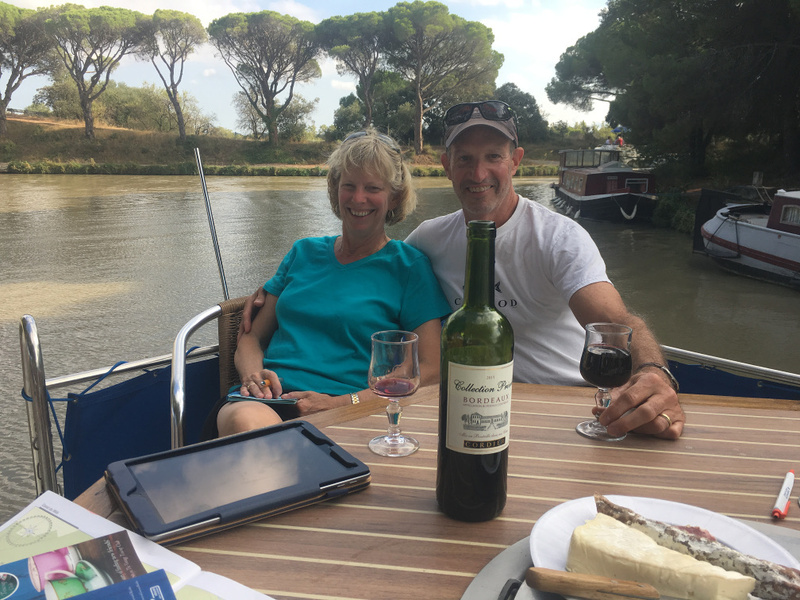 We arrived in Capestang about mid-afternoon and found it to be a lovely port. The town was actually quite crowded with boats lining both sides of the canal. In fact, we were fortunate to find a spot just large enough for the Buffalo Bill, right near the center of town. The ladies immediately headed into town to shop and explore. Roger and I waited for the Canalous technician to arrive to look at the A/C. Unlike yesterday’s no-show, however, the French speaking technician arrived within 15 minutes. Much to our grand surprise, he showed up carrying only a toilet plunger and a screwdriver. After a few diagnostic questions and flipping a couple of switches and dials, he proceeded to plunge the outlet port of the A/C water circulation line. Nothing. He then lifted the hatch to the engine compartment, disconnected the pump outlet hose, placed the end in his mouth and started to blow. Nothing again. 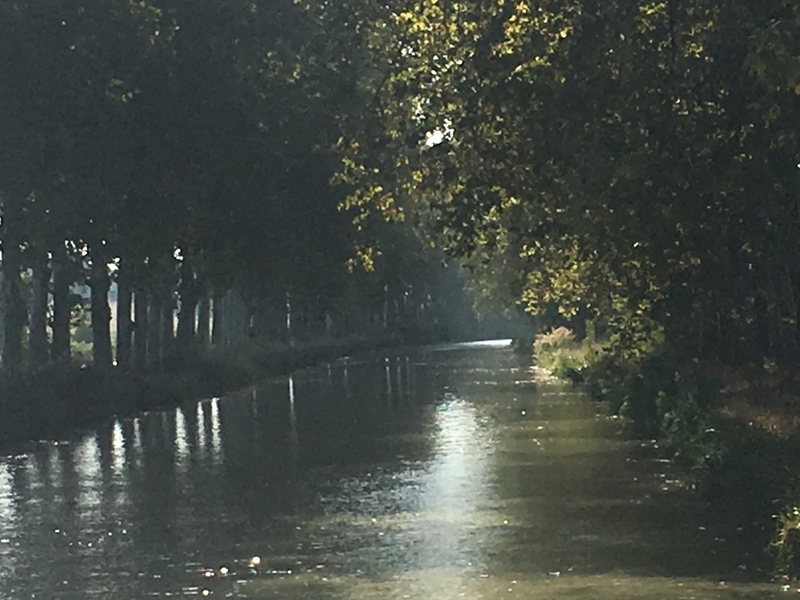 But with a big smile on on his face, he made a crack about “l’eau du canal”. After a few more minutes of fiddling around and re-plunging the outlet port - voilà – the water started flowing again. Roger Moore and Henry Warner sampling local Capestang beer. 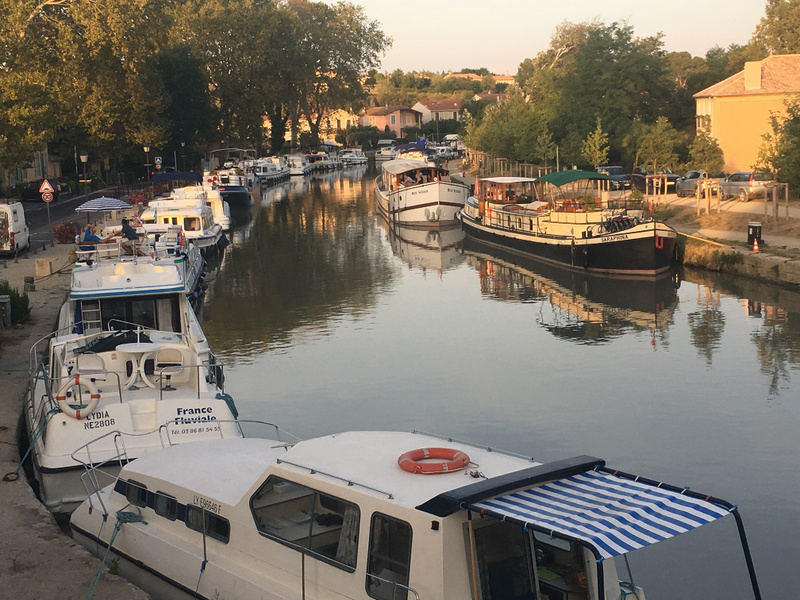 The ladies returned and informed us that they heard there was supposed to be wine tasting being offered by local producers on the other side of the canal. 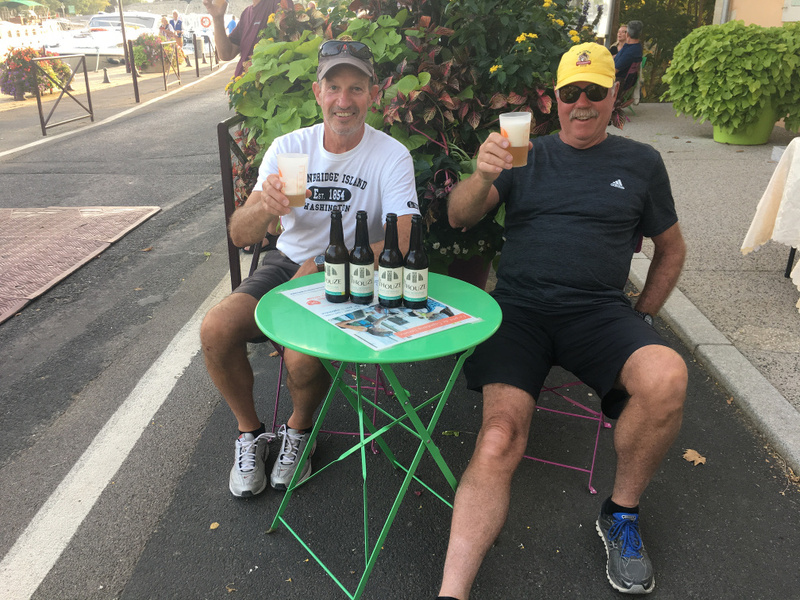 We all headed over to the other side of the canal where a crowd was gathered in front of the tasting table. We worked our way to the front of the line only to discover that today was beer night – not wine. 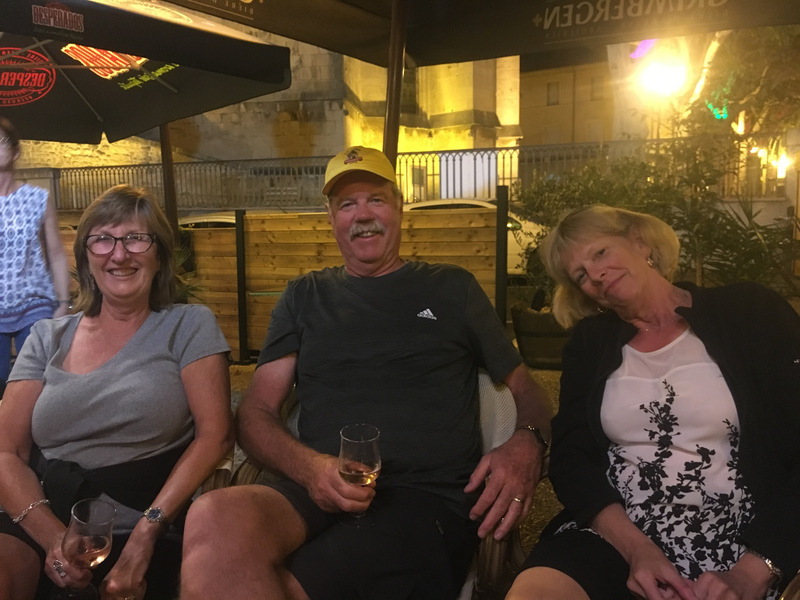 The ladies quickly lost interest, but Roger and I relaxed canal-side and enjoyed a couple of pours while listening to live classical music being played by musicians on a barge parked right next to us. Ah, the canal boating life! 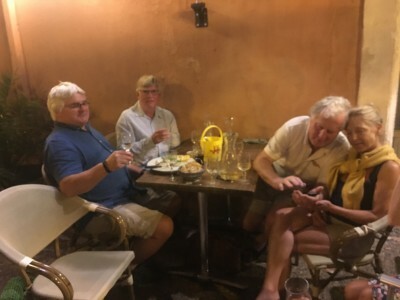 After happy hour, we all walked into the center of Capestang in search of a restaurant for dinner. The town is quite attractive with an imposing church and a long history dating back to at least Roman times. 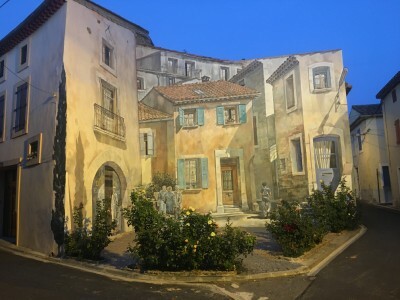 While walking about we came across some noteworthy wall murals of the trompe l’oeil (fool the eye) style. These were large, building-size works of art that had obviously taken some talent and effort to produce. Very impressive! For dinner we settled on an Italian restaurant that was quite good and we enjoyed the customary couple of pitchers of the house wine with our meals. Just for the record, most pitchers that we found were 50 cl, or 2/3 the size of a normal wine bottle. So two pitchers was the equivalent of one bottle and a third of wine (for four people). As we were getting up to leave our table, around 10:00 PM or so, the four folks at the adjoining table hailed us in heavily Irish-accented English asking us where we were from? Well that quickly got the conversation flowing and we were invited to sit down and join them. That started a fresh round of wine pitcher ordering, even though the restaurant owner probably wanted to close down, as we were the only people still there. But she kept bringing the wine pitchers and we didn’t end up leaving until after 11:00 PM. I don’t know when the Irish folks left, as they were still there when we departed. 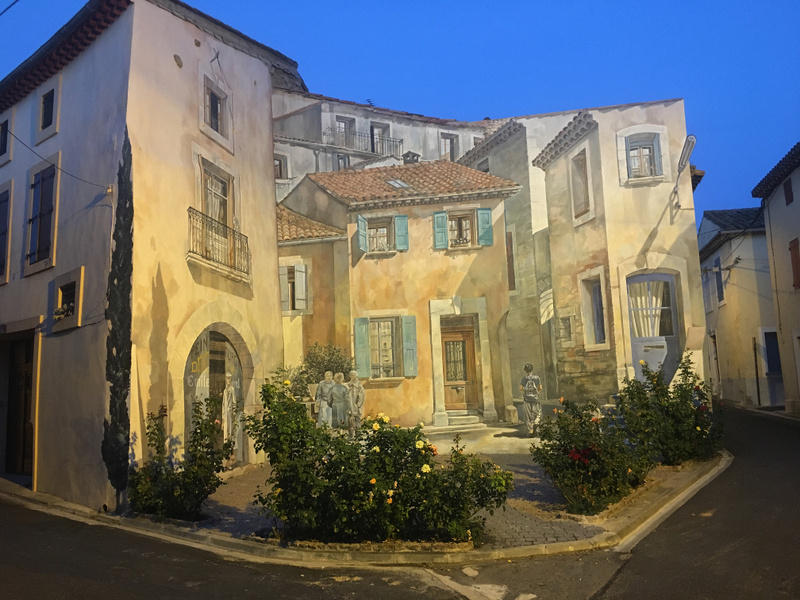 We strolled back to the boat through the peaceful, deserted streets of Capestang in the warm, summer-like air. To close out this day’s report, I will state that some in our group slept very well that night.